The guiding principle of the Energy Network is to provide education and information about the issues relating to energy utilization, production, infrastructure, economics, efficiency and conservation and the impact on northwestern lower Michigan region. What is the Energy Network? 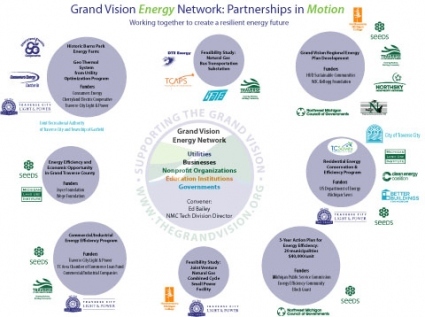 The Grand Vision Energy Network is a diversified group including members from utility companies and conservation groups. Our goal is two-fold: first, we aim to keep all perspectives around the table. Second, we provide unbiased information so residents can form educated opinions and help shape the type of power generation scenario they think is best for the region. The Grand Vision Energy Network is a citizen-led effort to inform and develop a regional energy plan. Energy was one of the focus areas that arose out the Grand Vision, a community engagement process launched in six counties in Northwest Michigan. As part of this work, an energy survey was conducted in December 2012 that collected data on energy utilization, production and choices for generating energy locally. This report provides the results from the survey. An analysis of where we are today is essential for setting reasonable and actionable targets for tomorrow. Click on the image to view/download. This report was prepared to provide the informational foundation for the development of an Energy Action Plan for the Grand Vision to Grand Action regional planning effort. Grand Vision to Grand Action has been funded through a Housing and Urban Development “Sustainable Communities Grant” to the Northwest Michigan Council of Governments. This fact sheet identifies four factors that matter in our exploration of Energy: Security, Economic, Environmental, and Personal. The main goal of the Energy Network can be summed up in one word – education. 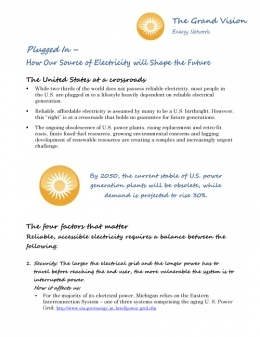 Our aim is to educate the citizens of northwest lower Michigan on a wide variety of energy topics so they can make informed decisions about our region’s energy future and their own personal energy choices. Energy is responsible for our quality of life and these issues affect every one of us. The Energy Network consistently offers a chance for people to involve and educate themselves on these issues through meetings, outreach and other events. Here is an illustration of the many partners who are working together to create a resilient energy future. Click here (PDF). Energy education efforts were showcased in a student video shown at the Grand Vision Your Action event in Traverse City in September. The video was produced for the Grand Vision Energy Network by Kyle Huggett, a student at NMC and the University Center. What Else is the Energy Network Doing to Educate People? We host an Energy Education Lecture Series featuring speakers on energy issues affecting Northwest Michigan. These lectures provide a great opportunity for people to learn about energy issues from the experts. The Lecture Series takes place at the Northwestern Michigan College campus on a monthly basis, from September to May. All events are open to the public and are free of charge. Click to view a video Energy Efficiency Practice and Policies, which provides a general framework to begin the building of a comprehensive management strategy or an energy action plan. How Can You Get Involved with the Energy Network? We hold monthly meetings where people can learn about the energy issues facing our region and get involved in the future of energy in Northwest Michigan. The meetings provide a great opportunity for the public to learn about all things energy. To be a part of the Energy Network check out the Google Group. For a list of dates and times for Energy Network monthly meetings and future event, please see the Calendar.